The most interesting story always has something to do with the success of people — the kind that serves as an inspiration to many, the kind that warms the heart, the kind that warrants an approving nod or a silent applause from the one who reads or hears the story. 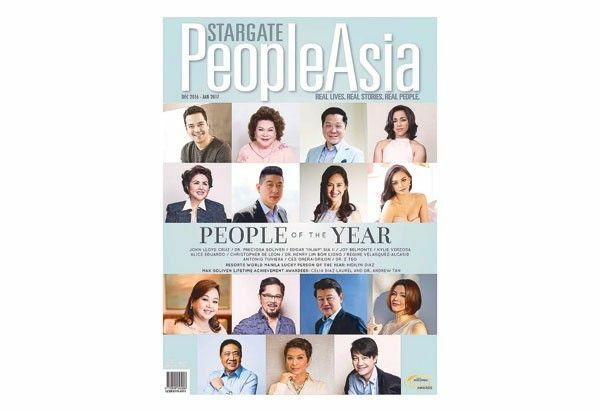 Award-winning PeopleAsia magazine presents its People of the Year awards for 2017. On its December 2016-January 2017 pages is a parade of names and faces of people who have made a difference in their lives and in the lives of others. They have made their country proud, and to some extent, they have made humanity a race to be loved, nurtured and celebrated all the more. The two Max Soliven Lifetime Achievement Awardees lead the list of this year’s People of the Year: tycoon Dr. Andrew Tan and artist Celia Diaz Laurel. Tan, chairman of Emperador, is without letup in expanding his brandy empire with the acquisition of Spain’s Fundador and Mexico’s Presidente, among others. The course of his success is not without potholes. Former UNESCO-Philippines Secretary General Dr. Preciosa Soliven marks a milestone in the field of education as her OB Montessori schools celebrate their 50th year in the country. The seasoned educator and diplomat gives equal opportunity to the staff who serve her educational institution. “Our teachers, and even our janitors, are encouraged to travel. After a few years of service, they can avail themselves of incentive travel. We organize groups to go to countries like Singapore, Thailand, China and as far as Turkey, Spain and Italy,” she says. Also pacesetters in this year’s batch of People of the Year are Dr. Z Teo, who now serves as the CEO of the Aivee Group, one of the leading authorities when it comes to beauty; and Dr. Henry Lim Bon Liong, whose company SL Agritech helped transform the local rice industry through the development of hybrid rice varieties suitable for Philippine soil. Entertainment and showbiz also take center stage on this year’s list. Leading man John Lloyd Cruz makes the list for his critically acclaimed performance in Lav Diaz’s Hele sa Hiwagang Hapis, and Ang Babaeng Humayo — both of which took the 66th Berlin Film Festival and the 73rd Venice International Film Festival by storm last year. Other awardees from the showbiz sphere are the uncrowned king of Philippine drama, Christopher de Leon, who has starred in over 130 movies, and first made history by winning the coveted Filipino Academy of Movie Arts and Sciences Best Actor award at age 17; Asia’s Songbird Regine Velasquez-Alcasid, who was the first Asian solo performing artist to stage a solo concert in Carnegie Hall; and TAPE Inc.’s president and CEO Tony Tuviera, the man behind the country’s longest running noontime show Eat Bulaga!, and the phenomenal AlDub love team. Also making this year’s list is beauty queen Kylie Verzosa. A previous PeopleAsia “Woman of Style & Substance” awardee and “Women of Allure” awardee, Kylie made waves when she bagged the coveted Miss International crown in Japan last year. Taking her rightful place among the awardees is Hidilyn Diaz, who receives the Resorts World Manila’s “Lucky Person of the Year.” Aside from her hard work and determination, Hidilyn admits that luck also played a crucial role in her ending the country’s 20-year medal drought, when she bagged the silver for weightlifting in the Rio Olympics. Her Chinese rival, then poised for a gold win, miscalculated and therefore lost her slot in the Top 3, resulting in Hidilyn’s rise from bronze to silver.